Right from the outset Tollesbury Time Forever is a wondrous and uplifting novel with a fable like quality to it. Ayris's use of beautiful descriptive writing is nothing short of breathtaking. Ayris turns a simple game of Cricket into a lesson. He makes a meal into an observation on life. Every conversation is fraught with meaning. 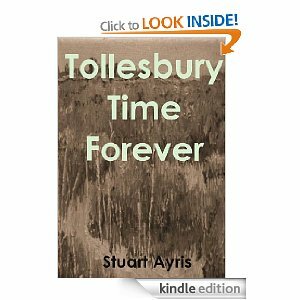 Tollesbury Time Forever is a story of redemption. Simon Gregory is a man who, for reasons unknown at the outset, has selfishly failed to live up to his responsibilities. He pays a high price for this as he continues to do so throughout his life. This ultimately leads to his disconnection and exclusion from society, withdrawing into himself. This is the story of that withdrawal and of the underlying "illness" behind it. A delightful soundtrack of Beatles songs pepper the novel and lots of other musical references and quotes add splashes of vibrant colour. The melancholy "truth" of this fairy tale world is revealed in part two. I have no wish to spoil anything so I'll be deliberately vague about aspects of part two of the book. Part two deals with matters of a more concrete and less ethereal nature. We see some of the characters from part one in a more grounded setting. We learn more about the real Simon and the problems he has been facing and indeed will continue to battle. As Simon strives to "improve" and he feels he must Ayris reminds us that "labels" used to describe mental illness are simply that and they speak nothing about a persons true perception and feelings. Although this is a serious novel there are moments to make you smile. There is a supermarket scene that will have you howling with laughter. A deeply affecting novel that lands lightly like a butterfly upon the beauty of life and not just the hardships. I now yearn to visit Tollesbury to see if my imperfect perception has done it justice. I doubt it. I don't know what liberties the author has taken with the facts and frankly that isn't important. Rarely have I read a novel that has affected me so deeply. It moved me to tears at its conclusion. Sublime. Wonderful. I should like to have a pint in the Kings Head and let the world fade into the background. Thank YOU. Rarely has a novel moved me so much. OK, looks like a great book to buy, therefore breaking my 'don't buy a book for a while' resolution from yesterda. Thanks Nigel - appreciate it mate!